Computers and other IT equipment have been blamed for causing as much global warming as the airline industry. The taskforce will oversee the piloting of a "green PC" service in which individual machines use 98% less energy than standard PCs. 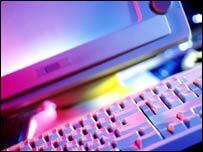 IT equipment is thought to generate 35m tonnes of harmful CO2 gas each year. The public-private "Green Shift" taskforce will be led by Manchester City Council. The "green PC" service works by hosting functions such as office applications, email and internet surfing on data centres rather than on individual computers. The data centres will be energy efficient and can be accessed through a small desktop box. The Green Shift programme will also aim to use 75% fewer resources in the production of PCs. Local Government Minister Phil Woolas said: "Cyber-warming is a massive issue and that is why we have taken decisive action with the appointment of the taskforce. "The new taskforce is the first of its kind in the world and is a sign of how serious the UK is about tackling this issue. "Innovative proposals like the green PC service are essential if we are to tackle climate change. "Only if all of our communities are engaged in action to tackle climate change will we be successful." Councillor Richard Leese, leader of Manchester City Council, said action needs to be taken on IT emissions because of cyber-warming. "The green PC service is part of a package of proposals that has the potential to make a fundamental contribution in meeting the challenge of climate change," he said. "Critical to our approach is that sustainability and inclusion go hand in hand. It's no use developing solutions that most people cannot afford." The service is set to be piloted in early 2008, ready for use in late 2009.